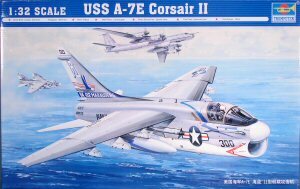 In 1/32 scale the first injection moulded kit of the A-7 Corsair was issued by Trumpeter in 2008, and what a welcome kit it was for US Navy fans. 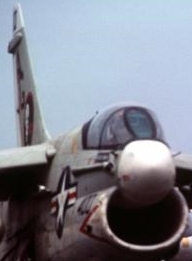 Kit #2231 is for a A-7E version with the odd text "USS A-7E", meaning it is a US Navy variant. 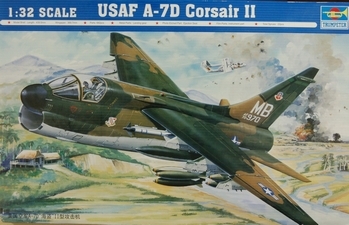 And a slightly different kit was also issued for the USAF A-7D. 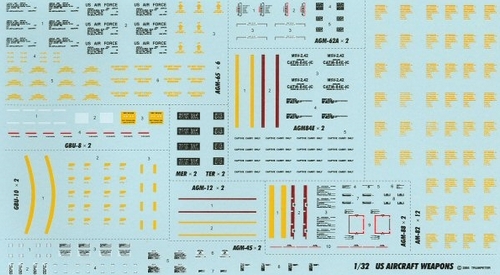 The A-7E kit comes with lots of parts and ordnance/stores. 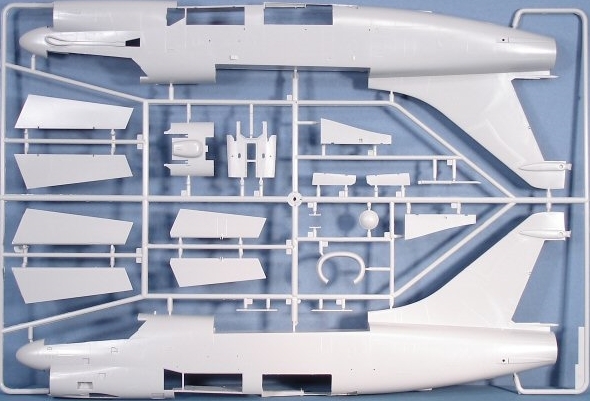 Some 30 photo etched parts, rubber tyres, white metal gear struts and off course over 600 plastic injection moulded parts in light grey are included. Kit instructions are fine in the usual Trumpeter style with 27 logical steps. 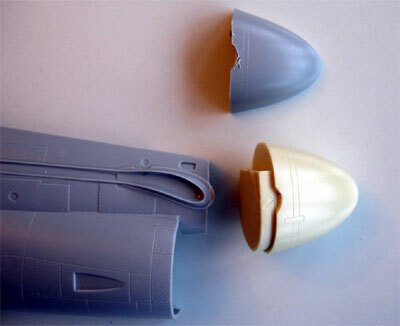 Lots of stores are included with 6 pylons and for example 2 external fueltanks and a LANA pod. Stores are besides various bombs and missiles like later generation AIM-9D/G/H Sidewinders also including AGM-88 HARM and AGM-84 SLAM. 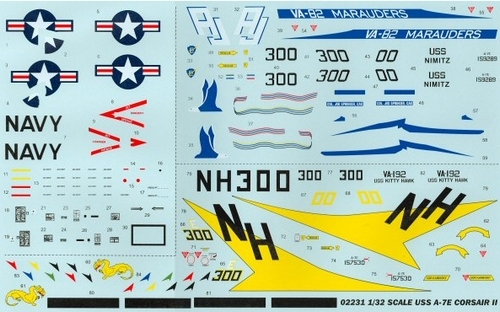 Some small errors are in the decals, e.g it should read CDR Joe Springer. For the stores, also decals are included. You also get a nice wing with separate flaps and slats. The wing tips are separate to be folded. When you want to have a nortmal straight wing, some filler and work is needed. 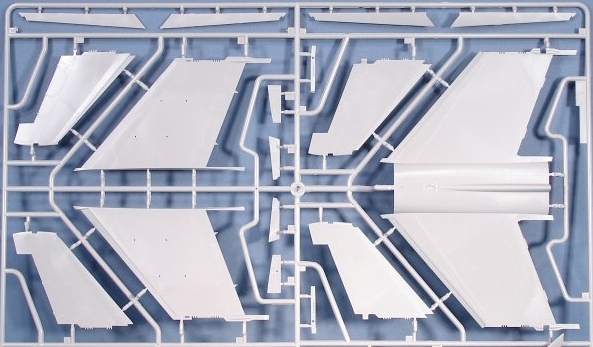 On the outside, the kit has the later on applied cable ducts below the wing root as on the later versions of the A-7E in etched metal. (So not on older versions). 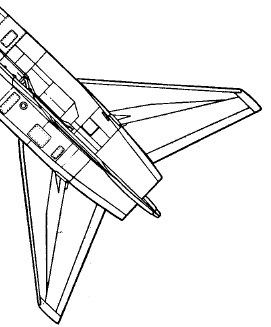 The lower fuselage ventral speedbrake is separate, but you need to close in for a plane on the ground. 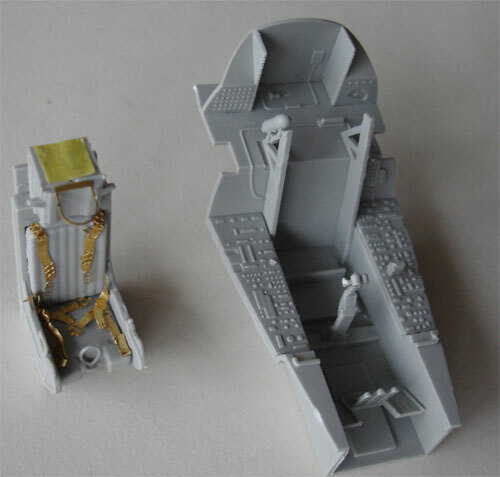 The cockpit itself looks OK with a tub and a nice SJU-8 seat , (an older style ESCAPAC seat is also on the sprues). 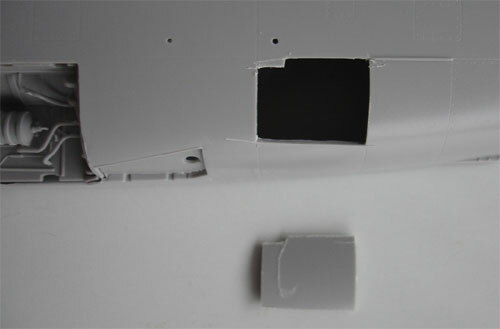 For the instrument panel a "film" is provided and clear parts with instrument faces. When painted up, it looks fine. Adding addtional details can obviously be done in this area. 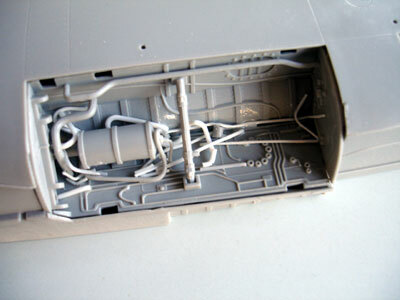 The main wheel wells look OK, adding some extra plumbing here from rod and sprue will enhance the looks even further. 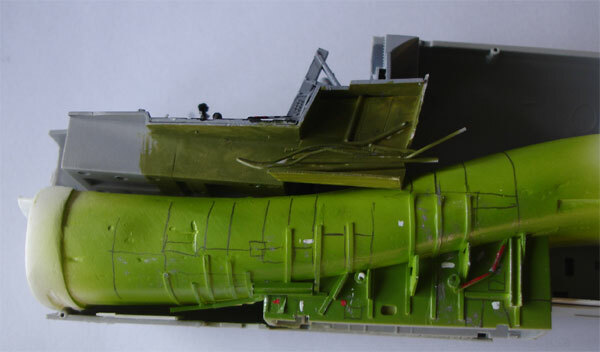 It is recommended to strongly fix the wheel bays in the fuselage halves with some strips. 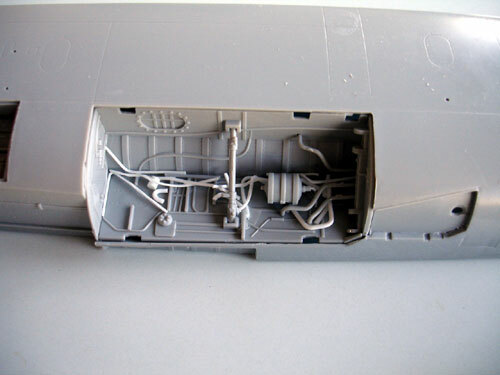 Landing gear legs have the option of metal or plastic with rubber tyres. 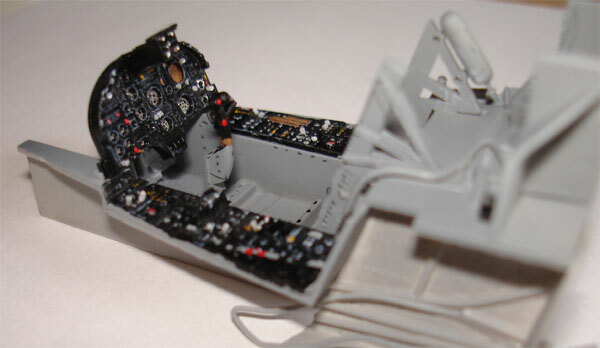 In the kit also a couple of opened up avionics bay are present. When adding some extra details, this will give some nice extra's to look at. For some A-7 versions, the boxes in these bays vary. 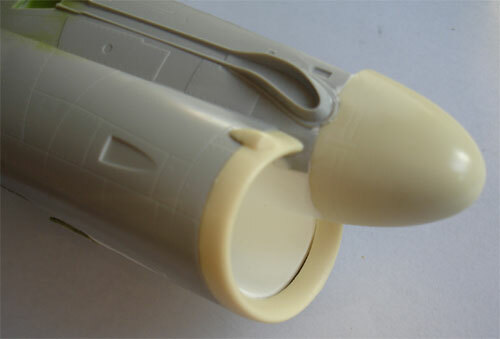 There is also some M61 Vulcan gun detail in the kit, but not a lot is seen. 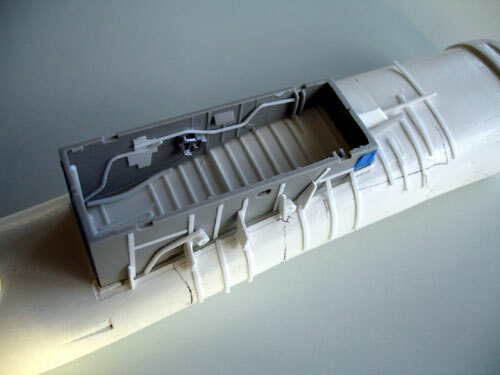 I decided to open up additional hatches and panels and add additional detail in the left forward fuselage area. 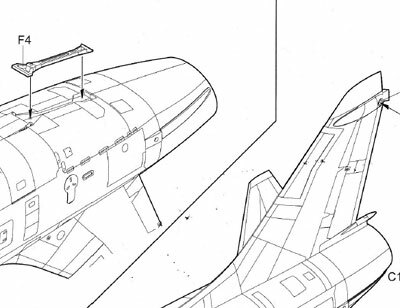 Correction 1: the overal shape of the cockpit canopy is not OK, it is way too flat. 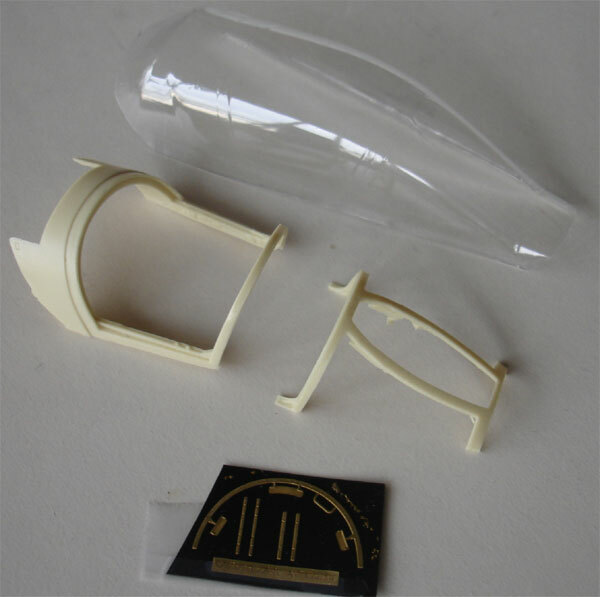 ZACTOMAN has issued a correction set in resin for this with nicely shaped canopy and windshield. 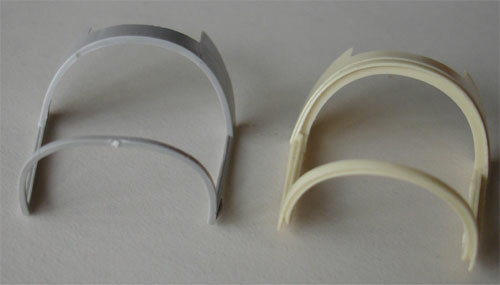 The shape difference in cross section of the canopy is obvious here, with the correct resin part on the right. 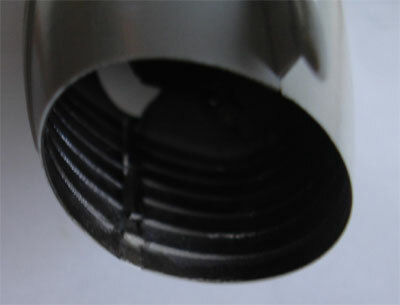 Correction 2: the nose intake lip is too thin and likewise the shape of the bullit nose. 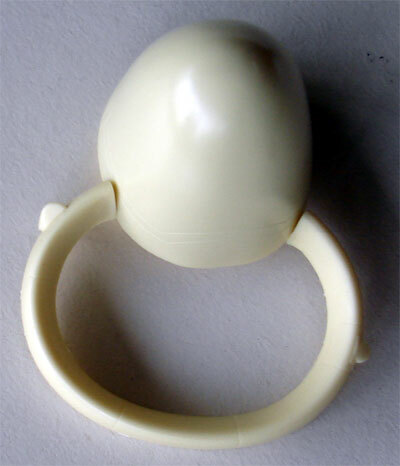 Again, ZACTOMAN has a conversion set for this; this set is available in 2 forms: with or without complete intake tunnel. Correction 3: the engine rear exhaust is not wide enough. 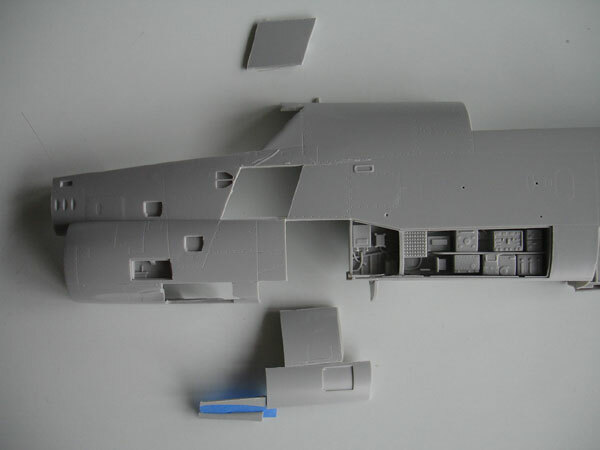 This can be corrected by the modeller as will be shown later on. 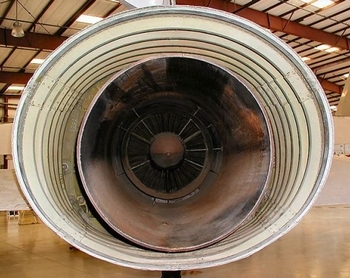 Also, the jet exhaust pipe will benefit from making it a bit deeper/longer. Overall, these 3 main shape issues make a lot of difference when corrected on how the final model will look like the real thing. 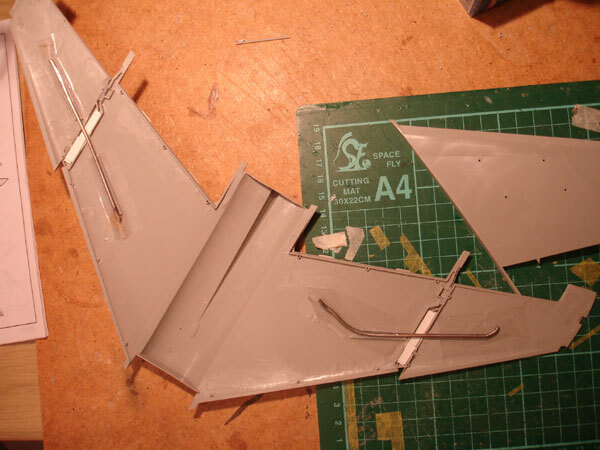 I started with some work on the major parts, like sanding off the USAF type antenna panel on the vertical fin. This is not present on a NAVY Corsair. 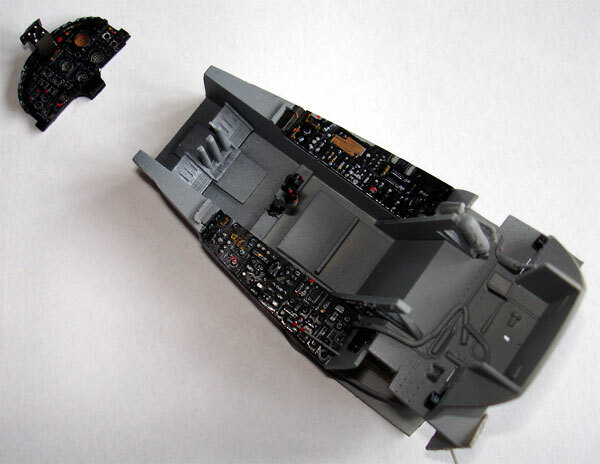 The very nice ZACTOMAN canopy set parts are seen here and assembled, ready to get a first grey base coat. Following the ZACTOMAN instructions this correction to the kit is not difficult at all. Turning to the cockpit tub, the basis is there in the kit and very good starting point for further detailling. Some plumbing and details from strip and rod were added, check your book references and/or internet with plenty of walkarounds.... The side consoles are with nicely done raised details. A coat of light grey forms the basic colour. 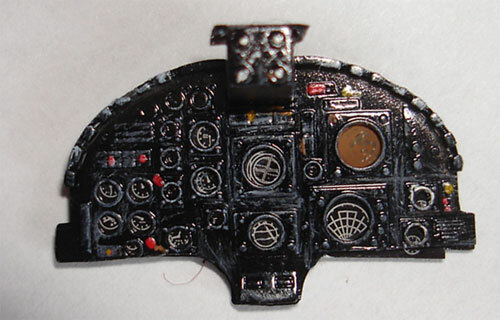 The result on the instrument panel, using the Trumpeter parts and painting with a fine brush and scribing with a marker. 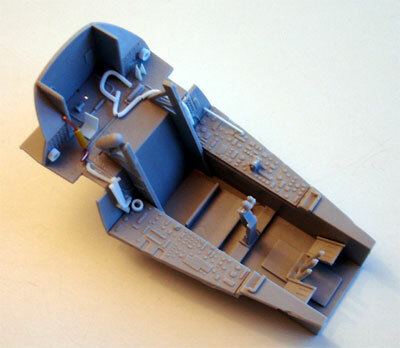 The overall cockpit was now ready for installment in the fuselage later on. 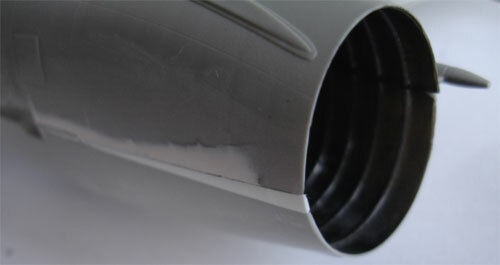 The ZACTOMAN intake tunnel, with will make the model look better. NOTE: you could leave out the complete tunnel as a lot will not be seen and order the some waht cheaper set. The other opened up hatches and bays are seen here as well. 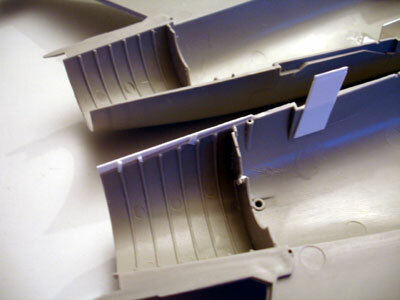 Details of plastic strip for the stringers and stiffeners. The overall fit needs checking when adding stringer details. A simple coat of chromate green was added, rest to be painted later on. The wing fold option was not to be used on this model. 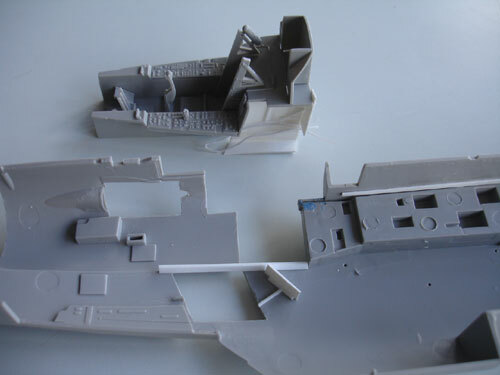 Strengthening the connection between the outboard wing-main wing sections is needed. I used a metal bar and card just to make sure. 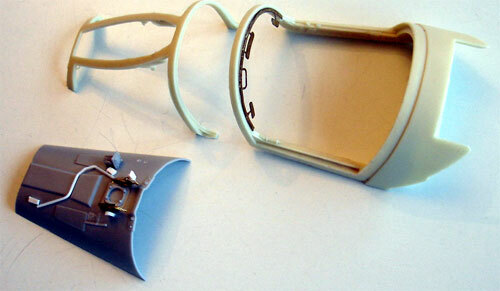 Filling and sanding is also needed. 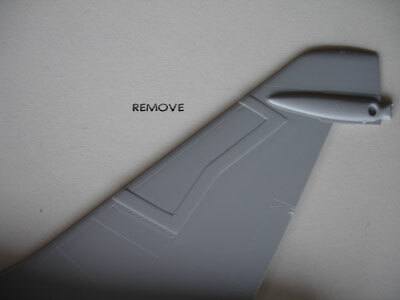 Start with the upper wing, make sure this is flat and than set on the lower wing tips. See also kit STEPs 14, 22, 24, 26, 27. 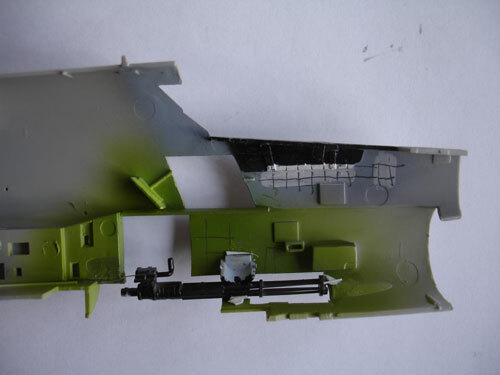 I now turned to the rear fuselage area. I believe the exhaust pipe gap is too small, it needs to be a bit wider. This can be seen on the picture and drawings. 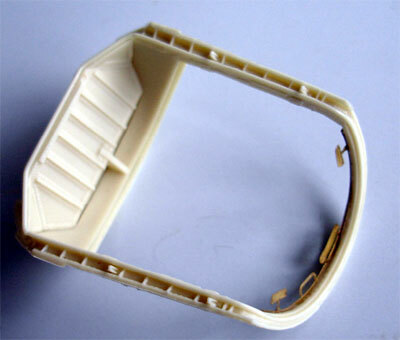 On the inside, the kit moulded stringers were lengthened with plastic strip. 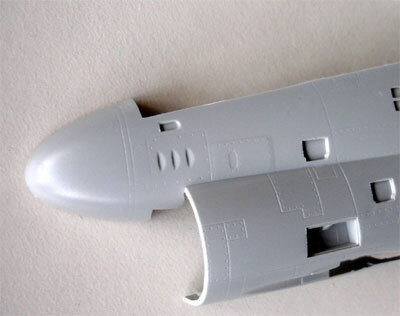 So after assembling and glueing in all internal details as per kit instructions up to STEP 10 and with some boxing in with card of the opened up hatches, both fuselage halves could be joined and the fuselage main assembly completed. The rear correction may not seem a lot is very well visible indeed! 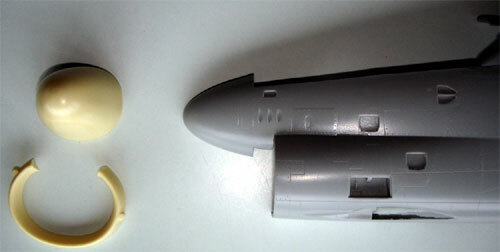 The exhaust pipe opening look significantly better now as on the real A-7 plane.